The EUR/USD has enjoyed a tremendous rally today thanks to weaker U.S. economic data, hawkish comments from ECB President Trichet and successful bond auctions in Spain and Portugal. The rally in the EUR/USD is the strongest in nearly 3 months and has led many people to believe that the downtrend in the EUR/USD is finally over. However in order for that to happen, the currency pair needs to break a very significant resistance level that sits not far above the current price. 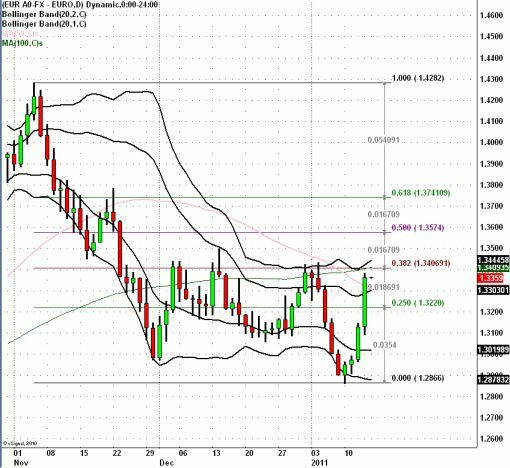 The EUR/USD has already broken its near term support of 1.3320, the 50-day SMA and the new resistance level is now 1.3425. A break of this level is much more significant than any of the breaks that we have seen today because this is where we have the 2nd Standard Deviation Bollinger Band, the 100-day SMA, former highs and the 38.2% Fibonacci retracement of sell-off that lasted from November to January. Not to mention that the European Sovereign debt problems have not gone away. A default may not be an imminent risk, but unless you have gone long euros already, I wouldn’t be a buyer unless it dips to 1.3050 or clears 1.3450.